Gas cylinder depletion warning systems have become an important part of the chemical manufacturing industry in safety, backup, and production in gas supply systems. Gas cylinder depletion warning systems are responsible for indicating visually, audibly, or through interfaced control systems, when a given gas cylinder is low on pressure. Alarm systems and indicators typically utilize pressure transmitters for pressure measurement and low pressure/depletion signaling. Gas cylinder safety applications in chemical manufacturing can include both sealed chamber inert gas purge systems and fire control systems. Gas cylinder depletion warning systems in backup gas applications provide warnings both when supply line gas pressure is below required levels and when the backup gas supply tank is low on pressure. Production gas cylinder depletion warning systems are used to signal when gases used directly in the production process are low and would cause a slowdown or stop in production should gas supply be lost. Pressure transmitters are used for gas cylinder depletion warning systems in oil, gas, petroleum, and chemical refining in gas cylinder output pressure measurement applications. 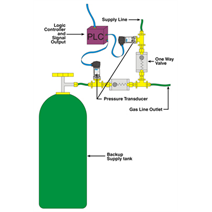 Chemical manufacturing gas cylinder depletion warning in oil, gas, petroleum, and chemical refining applications calls for pressure transmitter compatibility with various chemical manufacturing gases. 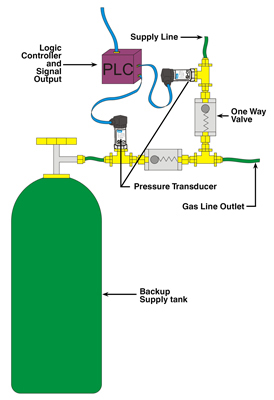 Pressure transmitters are responsible for pressure monitoring in gas cylinders and for providing signal output to indicate low tank pressures in system critical applications to ensure gas cylinder safety. The WIKA Hazardous Area Explosion-proof Pressure Transmitter Type E-10 and the Hazardous Area Explosion-Proof Transmitter with Flush Diaphragm Process Connection Type E-11 have been designed for use in chemical manufacturing applications and help ensure safety while using gas cylinders.